A true masterpiece in terms of sound quality, precision and playability – and it is now available in the NI Online Shop and from authorized dealers. 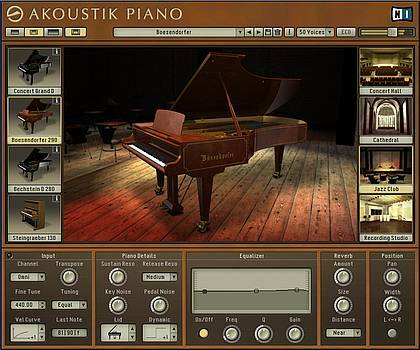 AKOUSTIK PIANO turns your computer into three famous grand pianos and a vintage upright. The uniquely authentic sound quality coupled with an expressive, unmatched playability make this software piano ideal for any pianist or producer. Take a seat and experience the beautiful sound of pristine pianos! AKOUSTIK PIANO fuses the sampled sound, expressiveness and playability of three of the most reputable grand pianos – the Steinway D™, Bechstein D 280™ and Boesendorfer 290 Imperial™ – as well as the charismatic Steingraeber 130™ vintage upright piano into one application. AKOUSTIK PIANO covers the entire range of piano sounds and styles, transfusing the sonic characteristics and subtle tonal nuances of all four into your computer – the perfect complement for studios, rehearsal rooms, schools, stages and clubs. AKOUSTIK PIANO is the new benchmark in sound quality, capturing the full body and feel of the originals with unprecedented authenticity. The latest recording technology as well as a specially developed microphone setup was used for all 4 pianos. The result is a uniquely warm, transparent and flexible sound that delivers the same distinctive character of each individual piano in exacting detail and can still be adjusted to meet specific needs. AKOUSTIK PIANO plays and responds exactly as real pianos do. The keys were sampled at varying velocities and great care was taken to capture the entire sustain and release phases. The brand new Layer Morphing Technology generates a seamless dynamic gradient. The characteristic resonances caused by use of the pedals can be adjusted as can the subtle mechanical noises of the pedals and keys themselves. From perfect pianissimo to forceful fortissimo, this instrument delivers the same breadth and depth of tone as the originals. AKOUSTIK PIANO has a first-class integrated convolution module, allowing highly authentic spatial characteristics to be added to the sound. Place the piano in a studio, jazz club, concert hall and a cathedral or use the dry signal as it is. The acoustic parameters of these spaces, such as the size, can also be manipulated. From the close mic setup of a jazz combo to the more ambient nature of classic solo performance, AKOUSTIK PIANO covers the whole spectrum. Василий Барзилович Дата добавления: 08 Апрель 2007 г.
Хороший звук у первого инструмента, но не понятно, зачем было так усложнять установку, - ничего не понятно!! Почему нельзя все диски распаковать в одну папку и из ней сразу все или выборочно установить?.. И у самой программы отсутствует кнопка назначения пути к библиотекам, а по запросу указываемые пути не понимаются. Не практичная программа! П.С. У Стилуса - какие сложные библиотеки, но всё работает удобно и чётко. Вы можете получить более детальную информацию о диске "Akoustik Piano [4 DVDs]" на сайте производителя. На нашем сайте вы можете скачать или купить почтой Akoustik Piano [4 DVDs]. Этот товар поступил в продажу в наш магазин 13 Октябрь 2005 г.
Хороший звук у первого инструмента, но не понятно, зачем был ..